For some, when it comes to switching to a fully electric vehicle, there is a concern that charging stations will not be there when they are needed. Ford has now come up with a concept to help allay those concerns – using big data to identify the most beneficial places to locate new rapid-charging points. Data scientists at the company have developed an algorithm, based on more than 1 million kilometres of driving data and including where vehicles actually stopped, to pinpoint the places that could help drivers integrate charging within their operating patterns, rather than making special journeys to out-of-the way locations. Following in-depth analysis in Greater London, the team concluded that it would be possible to significantly improve access to on-the-go charging through deploying a relatively small number of strategically positioned rapid-charging stations. As part of its Ford City Data Solutions Report, published in December, Ford fitted 160 connected vans with a simple plug-in device to record journey data. With the consent of participants, this generated more than 500 million data points, from more than 15,000 days of vehicle use, that was sent to the cloud for analysis. It was from this data, captured over an eight-month period, that Ford’s Global Data Insight and Analytics team were able to identify where charging points would be most useful to a fleet. Although the vehicles in the trial were not electric, it was possible to understand their operation and forecast their ability to access charge points as if they were. By seeing where vehicles travelled, where they parked and for how long, they could identify ways in which charging could be integrated within regular journeys, especially for businesses whose drivers might make multiple stops, for example, to make deliveries. It is an approach that Ford envisages could be extended to further cities, the data coming from connected vehicles, and enabling those cities to more effectively plan how to spend their infrastructure budget. 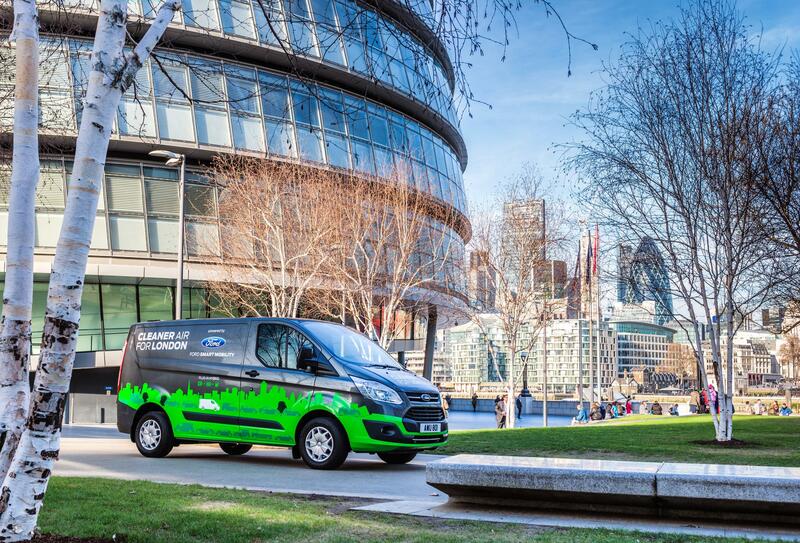 From a separate London fleet trial involving 20 Transit Custom plug-in hybrid electric vehicle (PHEV) vans, Ford also found that fleets operated in pure electric mode for 35% of their time on the road, increasing to 45% in Greater London, and to 68% in central London. During their trial – based on 80,000 kilometres of PHEV fleet mileage – no use of public charging facilities was observed. Vehicles were instead charged either at depots or at home. Furthermore, on average, vehicles started the day with only 45% charge, underlining the value that charging points en route could add. It was also found that operators became more adept at effectively charging vehicles, predominately at their depots, as time went on. Rapid-charging stations can provide up to 80% battery charge in 30 to 40 minutes. There are now more than a million electric cars in Europe and it is expected that worldwide, electric vehicles will account for the majority of all new car sales and a third of all fleets by 2040. But there are already concerns around a shortfall in the provision of charging points. Previously, Ford announced how big data could help make cities safer – by highlighting where future traffic incidents might happen. And the company last week revealed an extensive range of new vehicles under a new Ford Hybrid banner. The line-up of 16 electrified models announced in Amsterdam will cover everything from small family cars to SUVs and people movers – with a Mustang‑inspired performance SUV and fully electric Transit van on the way. Future all‑electric vehicles will be supported by the IONITY consortium that aims to build 400 stations in key European locations by 2020. Read about the Electric Nation project where data was collected from more than 140,000 EV charging events here.